What is an ISLAND FOX ? Friends of the Island Fox, Inc. works with government agencies, private conservation organizations, community groups, schools and individuals to support island fox conservation, research and public awareness. Island fox survival is threatened by habitat imbalances created by human actions. The good news is current conservation efforts are improving both the island habitat and increasing island fox numbers. 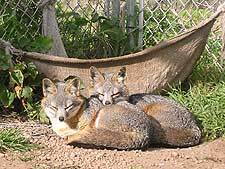 Captive breeding has allowed island fox species at the brink of extinction to make a come back. Captive breeding still taking place. Golden eagles remain a threat. Captive breeding still taking place. Golden eagles less of a threat. Captive breeding has been successful. All able foxes have been returned to wild. 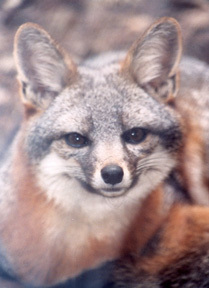 Anacapa and Santa Barbara Island have never had fox populations. Updated population numbers for all of the islands will be available in early July 2006. Captive breeding, public awareness and habitat restoration are improving the status of the island fox, but we still have a long way to go to reach healthy stable population numbers. You can help Save the Island Fox by supporting Friends of the Island Fox, Inc. and current conservation efforts on the Channel Islands.